St. Joseph’s provides a curriculum which covers the essential aspects of children’s cognitive, cultural and spiritual development. The curriculum is challenging, innovative and dynamic, presented by passionate, dedicated, creative teachers. All pupils in LGB have a personal notebook computer. (Because of insurance reasons, they are required to remain on the school premises.) Every child in LGA has access to an individual computer. 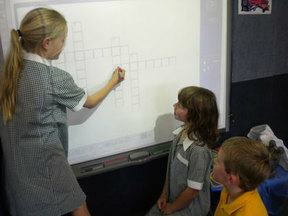 Each classroom has a television connected to a laptop. Inquiry Units include Civics & Citizenship, Science , Health, Technology and Art, Asian Studies, Sustainability and Aboriginal Perspectives and Democracy. Develop the skills needed to investigate and communicate information. Develop an appreciation of cultures other than their own. Communicate scientific understanding using appropriate scientific language to a range of audiences. Develop an understanding of the concept of fitness and health. Take an active part in creating environments that support health and participation in physical activity. To promote their own and other’s worth, dignity and rights as individuals and as members of the group. To use and access information using the current information technology tools, that are available at the school . NAPLAN- The National Assessment Program for Literacy and Numeracy (NAPLAN) is a set of assessment tasks, for Grade 3 and 5 children. Parents receive a written report following the Naplan tests. This report shows how the child has performed individually. This report is for the parents, the school receives a separate report. These reports are confidential. Homework, when set, aims at developing self-responsibility habits in the child therefore it can take two forms of which share equal importance – non-written and written. It should not be more than 15 minutes per night for Prep to Grade 2 (LGA). 30 minutes per night maximum for Grades 3 to 6 (LGB). Parent’s signature on the work or in the diary is seen as a valuable link between parents and school.